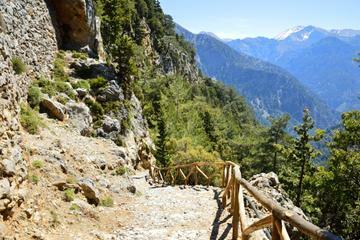 Enjoy this excursion to the prized national forest of Crete, the Samaria Gorge - the longest and most beautiful gorge in Europe. Walk through the gorge, approximately 11 miles (18 kilometers) which begins at the plateau of Omalos. Cross through the White Mountains and finish at the tiny village of Aghia Roumeli on the Libyan Sea. The route is enriched with flowers, herbs and trees, little fountains, abandoned settlements and wild goats known as Kri-Kri, as well as birds of prey. From the secluded village of Aghia Roumeli, take the boat to the village of Chora Sfakion to meet the coach for return trip to Heraklion.